The German word ‘Wunderkammer’ translates as ‘wonder-chamber’. These private collections of the rare, the curious and the wonderful typically included natural history specimens such as shells, insects, stuffed birds and mineral specimens, relics from ancient or exotic cultures, medical rarities and objects of exquisite and beguiling workmanship such as elaborate silver-mounted nautilus shells. During the 16th and 17th centuries such cabinets of curiosities – displays of wealth and erudition, intended also for scientific research and entertainment – were the precursors to public museums. These collections often included what appear now as extraordinary and unbelievable fakes, such as freakish creatures assembled from the parts of several different animals. Luke Roberts has collected objects which have sparked his curiosity over many years: op shop finds, pop culture wonders and the authentically rare and precious. These he combines with objects from museum collections in his contemporary ‘Wunderkammer’. Typically, the museum objects are things which are now more or less permanently in storage, considered kitsch, copies or just no longer valued. They are a suppressed ‘other’ to the tenets of contemporary museology, which ascribe cultural status and financial value. This particular ‘Wunderkammer’, assembled in an old AGNSW display cabinet, is one of four originally exhibited in Australian Perspecta 1991. It includes a sentimental 19th-century painting ‘He paid too much for his whistle’ by George Harvey and two sea shells carved in cameo-style, none of which had been exhibited for years. 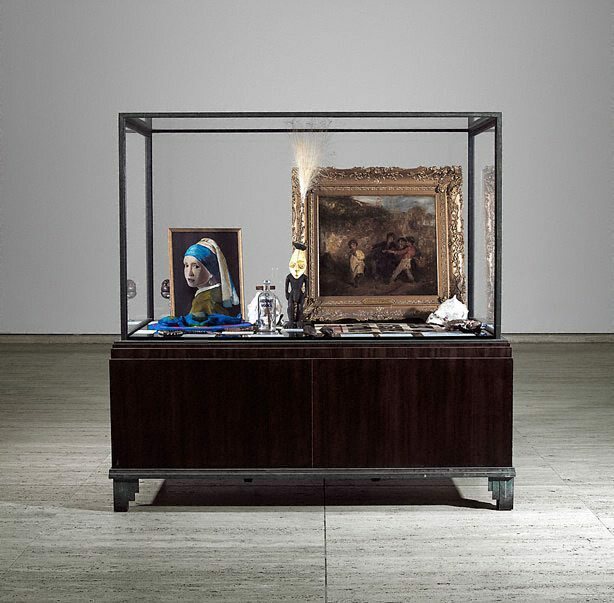 Roberts juxtaposes these objects, which are still retained by the AGNSW even though no longer considered worthy of display, with things that would not normally get a foot in the door. For instance, next to the painting of the boy and his whistle is a newspaper display sheet with the absurd but real text ‘girl ate herself to death’. Other objects include a beaded Indian doll, a bottle of vodka, a brick supposedly from Ned Kelly’s cottage, a wooden souvenir ‘fork’ from the Pacific Islands and a crucifix constructed from matchsticks. Each has a label which mimics museum style and which sometimes literally says what the object is but more often constructs a fantasy life for the object or presents it as evidence of something which could be true or entirely fictitious. These cabinet collections require a suspension of belief and even a faith in the museum which is perhaps akin to that required by reliquaries, collections of religious objects that purport to be anything from a fragment of the true cross to Christ’s foreskin. Luke Roberts grew up in rural Queensland and was educated by the Sisters of St Joseph, an experience which contributed to his interest in both Catholicism and the miraculous. One of Roberts’ best-known performance personas is Pope Alice, a drag religious emissary from outer space. Signed and dated on fork #205, ink "171294 Luke Roberts". Signed c. verso #96, black marker "Luke Roberts". Dated l.r. billboard #113, ink "310391" and verso base crucifix #164, ink "160894".